This is my final blog update on the 2018 Legislative session! On Tuesday, March 27th, the House met for the 12 and final week of the 40 day session. We completed the last day of session, or “Sine Die,” on March 29th. Last week consisted of busy, late nights as my colleagues and I strived to complete our work. In this blog post, I’ll share some of the bills we were able to pass. -and to be informed of their rights. These measures would put our laws in line with other states who have adopted similar legislation in order to protect the rights of crime victims. – and senior living care or hospice services. The point of this measure is to hold authority persons accountable who have our most vulnerable citizens under their care. -requiring courts to consider the accused’s financial resources, earnings, and other economic factors when determining bail. -In local ordinance violations cases, the court would be authorized to allow the defendant to satisfy any fines or fees through community service, and courts would be able to waive, modify, or convert fines and fees if the defendant has undergoing financial hardship. Under SB 407, the Judicial Council of Georgia would create a uniform misdemeanor citation and complaint form for use by law enforcement officials and the bill would allow misdemeanors to be prosecuted by accusation, citation or citation and arrest. Additionally, SB 407 would expand the list of misdemeanor crimes an officer can arrest by citation. Prior to the offender’s release, an officer would need to review the accused’s criminal record and ensure that the accused’s fingerprints are obtained. This bill would authorize accountability court judges to order the Department of Driver Services to reinstate or revoke driver’s licenses or limited permits as a reward of sanction for actions in the accountability court, and the court would be able to grant petitions for early termination of probation that the state does not oppose within 90 days of receiving the petition. SB 407 would cap supervision fees collected on pay-only probation at the rate in the private probation company’s contract, and the court would provide probationers who fail to report a 10-day grace period from the time the officer mails a letter to the probationer, as long as the probationer reports. This bill also includes provisions pertaining to firearm theft and those prohibited from firearm possession. SB 407 would authorize the Department of Community Health to share info on the prescription drug monitoring program database with federal agents and would allow for disclosure to out-of-state prescription drug monitoring programs operated by governmental entities. Lastly, SB 407 would allow Technical College System police officers to arrest for offenses committed on or within 500 feet of a Technical College System property. Under Governor Deal, our state has made significant strides in criminal justice reform. Senate Bill 407 will serve to further define and improve Georgia’s criminal justice system. The House passed Senate Bill 427 which would require the courts to consider an obligor’s, or an individual that owes child support, earnings, income, ability to pay child support, and the basic needs of the recipients of such child support when making decision about child support costs. If a parent cannot produce reliable evidence of earnings, his or her income for the current year may be assigned by the court based on the parent’s ability to earn and other economic factors. If the parent is incarcerated, his or her income may be assigned based on their actual income and available assets, not based on their pre-incarceration wages. SB 427 would also prohibit courts from treating incarceration as willful or voluntary unemployment or underemployment when setting child support costs. Additionally, SB 427 provides that a child’s enrollment in a public health care program, such as Medicaid or PeachCare for Kids, may satisfy the health care requirement for providing for the child’s health care needs in a child support order. Such enrollment however would not prevent a court from ordering parents to insure their child. Under Senate Bill 401, would require postsecondary institutions that provide dual credit courses to provide enrollment and student record data to the Office of Student Achievement and to the statewide longitudinal data system. Also, the Office of Student Achievement would collect and monitor enrollment and student record data for dual credit courses and would annually measure and evaluate the dual enrollment program. Senate Bill 401 would require middle school students to be provided with counseling and information to assist them in evaluating their career oriented aptitudes. Students would develop a graduation plan with their parents or guardians based on academic skills, career aptitudes and interests before the end of the eighth grade. Under this legislation, the Department of Education would be required to review each school counselor’s role, workload, and program service delivery in grades 6-12th. The department would report findings to the State Board of Education and the Georgia General Assembly including recommendations for improvements for counselors to ensure student success in academic skills, career oriented aptitude, and career interests. Finally, SB 401 includes provisions that would help prepare students in Kindergarten-9th grade to address sexual abuse, and will allow funding for students taking dual credit courses at eligible eligible postsecondary institutions that use nonstandard term systems. On March 29th, the House finally passed two significant measures—Senate Bill 402 and House Bill 930. SB 402 contains technical changes to facilitate broadband expansion to rural areas including implementing grant programs for rural broadband. House Bill 930 would create a new regional governance and funding structure for transit in Metro Atlanta. This bill means to improve the coordination, integration, and efficiency of transit in the 13-county Metro Atlanta region. Before we officially adjourned Sine Die for 2018, the House gave final passage to House Bill 684— The Fiscal Year 2019 ( FY 2019) budget. The FY 2019 budget includes $166.7 million for local school systems, $16 million for school security, $100 million in bonds for transit, and additional funds the meet several, various needs of the state. 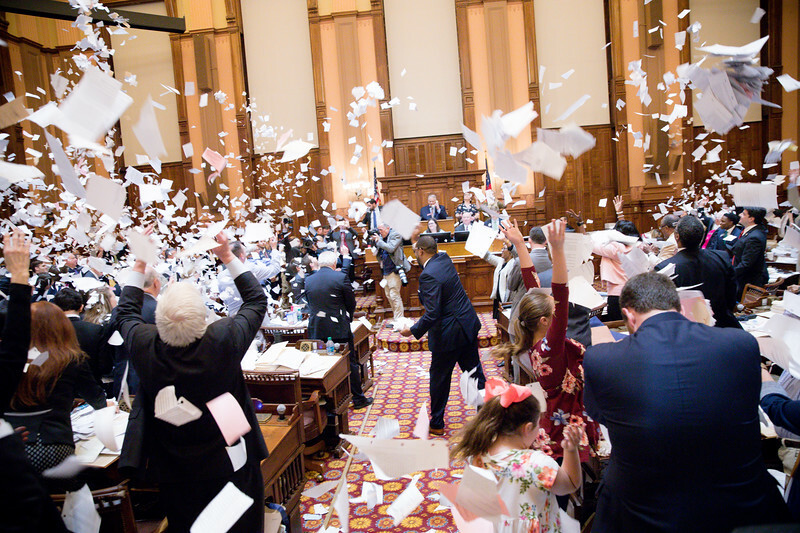 With Sine Die competed, the General Assembly has adjourned for this year’s 40 day session. Over the next 40 days, Governor Deal will review and sign or veto measures that were passed during session. Any piece of legislation not signed or vetoed within those 40 days will become law. I encourage you to reach out to me with questions and concerns about the bills the General Assembly have been working on. You are always welcome to come and visit me at my capitol office located at 601-C Coverdell Legislative Office Bldg. Atlanta, GA 30334. You can view my committee assignments for legislative term here. Please feel free to contact me by phone at 404.656.0254, or by email at dale.rutledge@house.ga.gov. Don’t hesitate to reach out throughout the legislative session with any opinions or questions you may have. I look forward to hearing from you! 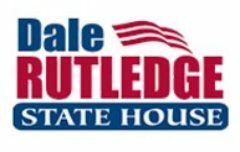 Next Next post: Vote Dale Rutledge in the November Election! Thank you for your interest. Please share your ideas with me. I look forward to hearing from you. © 2018 Dale Rutlegde Website. All Rights Reserved.